The ancient Greeks told us that those whom Gods wish to destroy, they first make mad. That may have been true in the ancient times. These days, the Gods turn them into novelists. Writing a novel for the first time is guaranteed to drive anyone crazy. It was plain stupidity that made me embark upon this misadventure. 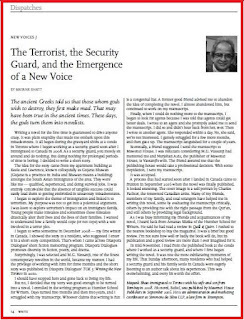 It all began during the graveyard shifts at a condo in Toronto where I began working as a security guard soon after I immigrated to Canada in 2008. As a security guard, you mostly sit around and do nothing. But doing nothing for prolonged periods of time is boring. I decided to write a short story. The idea for the story came from my apartment building at Keele and Lawrence, known colloquially as Gujarat Bhawan (Gujarat is a province in India, and Bhawan means a building) amongst the South Asian immigrants of the area. They were like me – qualified, experienced and doing survival jobs. It was entirely conceivable that the absence of tangible success could easily lead them to getting embroiled in unsavoury misadventures. I began to explore the theme of immigration and linked it to terrorism. My purpose was not to get into a polemical argument. I was keen to explore terrorism’s impact on an immigrant family. Young people make mistakes and sometimes these mistakes drastically alter their lives and the lives of their families. I wanted to understand how a family would cope (or not cope) with a son involved in a terror plot. I began to write sometime in December 2008 – my first winter in Canada. I showed the story to a resident, who suggested I enter it in a short story competition. That’s when I came across Diaspora Dialogues’ short fiction mentoring program. Diaspora Dialogues promotes diversity in fiction, poetry and drama. Surprisingly, I was selected and MG Vassanji, one of the finest contemporary novelists in the world, became my mentor. 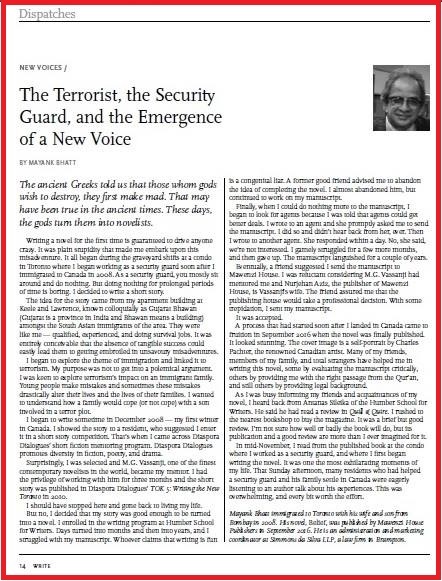 I had the privilege of working with him for three months and the short story was published in Diaspora Dialogues’ TOK 5: Writing the New Toronto in 2010. I should have stopped here and gone back to living my life. But no, I decided that my story was good enough to be turned into a novel. I enrolled in to the writing program at Humber School for Writers. Days turned into months and then into years, and I struggled with my manuscript. Whoever claims that writing is fun is a congenital liar. A former good friend advised me to abandon the idea of completing the novel. I almost abandoned him, but continued to work on my manuscript. Finally, when I could do nothing more to the manuscript, I began to look for agents because I was told that agents could get better deals. I wrote to an agent and she promptly asked me to send the manuscript. I did so and didn’t hear back from her, ever. Then I wrote to another agent. She responded within a day. No, she said, we’re not interested. I gamely struggled for a few more months, and then gave up. The manuscript languished for a couple of years. Eventually, a friend suggested I send the manuscript to Mawenzi House. I was reluctant considering MG Vassanji had mentored me and Nurjehan Aziz, the publisher of Mawenzi House, is MG Vassanji’s wife. The friend assured me that the publishing house would take a professional decision. With some trepidation, I sent my manuscript. A process that had started soon after I landed in Canada came to fruition in September 2016 when the novel was finally published. It looked stunning. 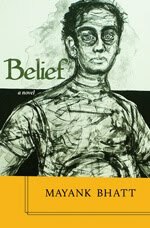 The cover image is a self-portrait by Charles Patcher, the renowned Canadian artist. Many of my friends, members of my family, total strangers have helped me in the writing this novel, some by evaluating the manuscript critically, others by providing me with the right passage from the Qur’an, some others by providing legal background. As I was busy informing my friends and acquaintances of my novel, I heard back from Antanas Sileika of the Humber School for Writers. He said he had read a review in Quill and Quire. I rushed to the nearest bookshop to buy the magazine. It was a brief but good review. I’m not sure how well or badly the book will do. But its publication and a good review are more than I ever imagined for it. In mid-November, I read from the published book at the condo where I worked as a security guard, and where I first began writing the novel. It was one the most exhilarating moments of my life. That Sunday afternoon, many residents who had helped a security guard and his family settle in Canada were eagerly listening to an author talk about his experiences. This was overwhelming, and every bit worth the effort. Q. Congratulations on the latest award. You seem to have made a habit of winning awards with a monotonous regularity. Please give more details about the award. A. I’m flattered and humbled. I’m not in the habit of receiving such international awards. It’s a pleasant surprise to receive the prestigious Ghalib Award for Drama – 2016. Good heavens! It’s taken over 45 years for my plays to be considered worthy of such awards! Just kidding. I was invited for the Sadaf International Award for Drama 2016 in Doha Qatar, recently, and while I was travelling with my Datangoi performances across the Middle East, I got this news while we were in Jeddah that I was being honoured with the Ghalib Award. The Doha award was for ₹100,000, and the Ghalib award for ₹75,000, I’ll definitely cherish the Ghalib award because of its historical significance. Let me give some background about the Ghalib Awards. The Ghalib Institute was established in New Delhi in 1971 by the then President Fakruddin Ali Ahmed. It’s a fitting memorial to Mirza Asadullah Khan Ghalib. It’s managed by a Trust. The Drama Awards (along with other categories) were launched in 1973, with the purpose of promoting Urdu drama and literature. Among the award winners have been stalwarts of Indian Urdu drama and literature such as Ismat Chughtai, Habib Tanvir, Sheela Bhatia, Kartar Singh Duggal, Mohammed Hasan, A.R. Kardar, Rajinder Singh Bedi. I’m honoured and humbled to be in such august company. Q. 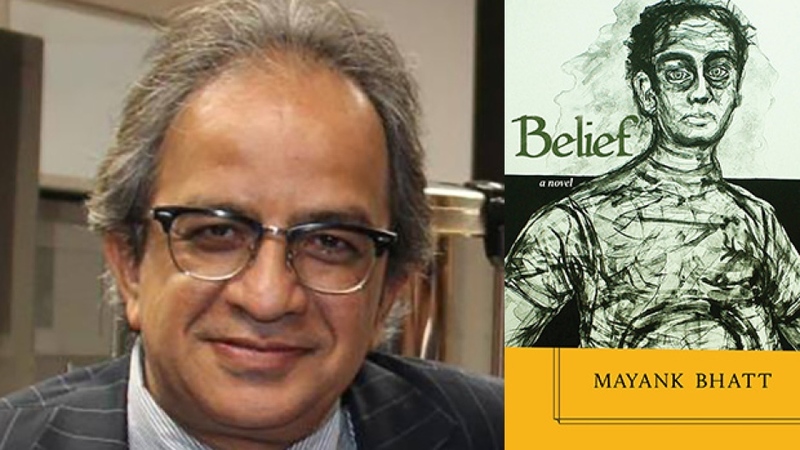 You have pioneered diasporic writing in Urdu in Canada. Your stories and plays are different from other writers in Urdu because you focus on the lives of immigrants in Canada. What motivates you to write about immigrants? A. My diasporic plays, or as they’re better known as Mahjari drama in Urdu, are different from the creations of other diaspora writers. The difference is that my plays are diasporic in theme and content, they talk about Canada and immigrant Canadians. There is not a single book of diasporic dramas or for that matter any other Indian language besides English at least in Canada, and perhaps anywhere in the West. Yes, there’s poetry, fiction, novel, but no plays on the problems and pleasures of immigrants. As an immigrant myself, I’m especially interested in the lives of immigrants. I believe that unless you as a creative person have not experience through the cultural, emotional and psychological turmoil and tested yourself, you cannot write on immigrant issues with any empathy. There are better and mature plays written in most of the languages including Urdu in India, but none of them captures issues we face in everyday life as immigrants. It’s a different world, completely different experience. Q. Which of your creations will withstand the test of time, and why? A. I have 12 published Books to my credit, but I believe my collection Hijrat Ke Tamashey (Plays of Migrations) will stand the test of time. It’s 26 years since the first edition was published, and up to now it has gone into reprint three times and the fourth edition is coming out next month. The play is important because it was the first play of its kind, dealing with the life of immigrants. Prior to that, there were no plays on this subject in Urdu. A Bengali version, titled Bhopa has been published twice. Many of the plays in that collection have been translated into Hindi, English and Swedish. It’s received numerous awards; an M. Phil was done on the play by a student of Urdu literature at the Delhi University in 2013. A 13-episode serial was produced by Omni TV during 2007, which has had five reruns so far; it’s also been dubbed in English, too. A telefilm Bara Shayer Chota Admi was produced with local artists in Toronto in 2013; it’s a controversial play from this book. My theatre group Rangmanch Canada has been active in organising an annual Hindustani Drama Festivals, showcasing the rich heritage of Indian Theatre, with multilingual drama presentations (not just in Urdu). I’m bridging the language barrier and bringing communities together. Q. You brought Dastangoi to Canada and toured with it to the Middle East recently. Explain what this verbal narrative form and what does it seek to achieve? A. I love challenges, I always try to do something different, some venture which is not been tested in Canada before. Dastangoi is my new found love, It’s a Persian word, dastan mean tales and goi, is to tell a tale. It’s a 16th century Urdu oral storytelling art form. One of the earliest references in print to Dastangoi is a 19th-century text containing 46 volumes of the adventures of Amir Hamza, titles Dastan e Amir Hamza. This art form reached its zenith in the 19th century, but it’s said to have died with the demise of Mir Baqar Ali in 1928. Shamsur Rahman Faroqi revived it in the 21st century. In recent years, it became popular in India, especially Delhi with Mahmood Faroqi and many others, with new tales and subjects. I took the challenge of reviving this forgotten art form in Canada but wove the tales of our immigrant experiences. The format style and dress code remain the same traditional 16th century, but the tales I’m telling are of present day immigrant life, problems and pleasures. It’s unique because I’m telling the story of five different characters, with five different dictions and dialects; it’s called Boli tholi in brij bhasha and Hindustani. This form needs a captivating voice, and I use it to my full satisfaction. I’m confident that my audiences in Canada and overseas will remember 'Dastan Hijraton Ki’ for a long time. Q. Who among your contemporaries do you consider as writers of calibre in Urdu language? A. We have some celebrated Urdu writers in Canada, but in my field (playwright) there is no contemporary. The stage of Urdu drama is vacant. We often have some Urdu plays staged, some are a comedy and some commercial plays, but the question is there is no published collection of Urdu drama in Canada. Religious violence is endemic to the Indian subcontinent. Its unpleasant legacy of hatred may be traced to the formation of religion-based nationalistic ideologies in the 19th century. However, it has grown exponentially after India became an avowedly democratic nation after its Independence from the British rule; a nation that constitutionally guaranteed universal rights to all its citizens irrespective of their religious beliefs. There are many reasons the Indian State has not been able to find an effective and a lasting solution to the menace of religious violence. Primarily, it is the presence (and the ascendency) of political forces that espouse Hindutva – the majoritarian ideology which denies the minorities the basic human rights. The present government in New Delhi, which is led by the Hindu nationalist Bharatiya Janata Party (but is a coalition of over 40 political parties called the National democratic Alliance), has seen an unprecedented revival of ideology-driven intolerance against all minorities both religious and caste based. The Hindutva forces have, in particular, targetted India's Muslims. Innumerable incidents have been recorded since 2014 when Narendra Modi won the parliamentary elections and became the Prime Minister of India. These incidents are proof of a rapid and comprehensive deterioration of the values enshrined in India’s constitution. The Modi government is on a mission to change the ethos of Indian nationhood that has traditionally been based on acceptance of differences and respect for diversity. These values found a reflection in the Indian constitution, which also ensured affirmative action in favour of those sections of the society that had been traditionally subjected to a subservient existence. The Modi government’s mission to change Indian ethos includes (but is not limited to) to a naked assertion of Hindutva ideology in all spheres of the Indian polity, including, dismayingly, even the judiciary and the media. The Indian civil service has been steadily infiltrated by the Hindutva ideologues, and the executive arm of the government is under despotic control of the Prime Minister of India and his thuggish henchman Amit Shah, the head of the ruling BJP. 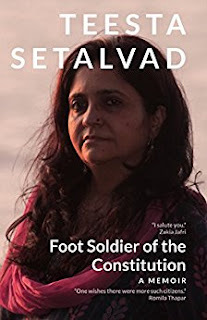 It is important to keep this perspective in mind when reading Teesta Setalvad’s memoir Foot Soldier of the Constitution. The memoir is a historical testament to the genocide of Muslims in the western Indian state of Gujarat, and the epic battle she has waged against the State apparatus hijacked by the Hindutva forces led by Narendra Modi, who was the Chief Minister of Gujarat, and who is culpable in the carnage. Nearly two thousand Indians were killed in the 2002 carnage in Gujarat, and most of them were Muslims. Religious violence of this magnitude is rare but not uncommon in India, where every decade or so, subterranean tensions bubble over, leading to rioting and deaths mostly of Muslims. Where the 2002 Gujarat riots have proven to be different is in the unprecedented number of culprits being convicted for their role in the riots. This is because of Setalvad’s indomitable courage and dogged persistence and perseverance. MJ Akbar, who for four decades, was India's foremost chronicler of atrocities against all minorities, and who is now, unconscionably, serving as a junior minister under Modi, also praised Setalvad before he joined the dark side. He wrote: “The important, and vital, point is that justice survived the malfeasance of the system; perhaps that is the only point. The courts were assisted by the dedication and sheer determined obstinacy of civil society leaders like Teesta Setalvad, who refused to be defeated by the acquittal of the accused by a court in Gujarat, and went to the Supreme Court...Thank God for Teesta Setalvad and the Supreme Court. And thank God for a free media too. We will see if media has the tenacity of a Teesta Setalvad or not.” (Peace of Justice, 26 February 2006, Asian Age). The slim book is an exhaustive detail of the cases that Setalvad has pursued to bring justice to the victims and victim-survivors of the Gujarat carnage. It comprehensively lists the failure of the Indian State in defending its Muslim citizens and records its failure to bring justice to those who faced utter desolation as a result of the riots. Faced with impregnable walls of officialdom, Setalvad’s frustration is palpable in many places in the book. At another place, she laments, “India is at best an electoral democracy tottering or edging often towards majoritarianism and mobocracy. In a constitutional democracy, the last word of dissent should have a legitimate place and should be respected. “The rights of the voiceless and the marginalised – the victims of deep institutional communal, caste and class bias – need to be taken not just seriously, but brought on par with the resourceful defences put forward by the State that is backed by its vast administrative and monetary arsenal. The book is an important chronicle of the death and devastation wreaked upon the Muslims of Gujarat and the facile attempts by the state apparatus to cover-up the crime. It proves (not that proof was ever needed) that behind the glib shibboleths of secularism and democracy the Indian State is deeply prejudicial and inimical to its Muslims citizens. The horrific details of the genocide in the book will shock an average reader who is largely dependent upon mainstream and social media for news, views and information.